Download the lastest Debian image from beagleboard.org/latest-images. The "IoT" images provide more free disk space if you don't need to use a graphical user interface (GUI). The Debian distribution is provied for the boards. The file you download will have an .img.xz extension. This is a compressed sector-by-sector image of the SD card. 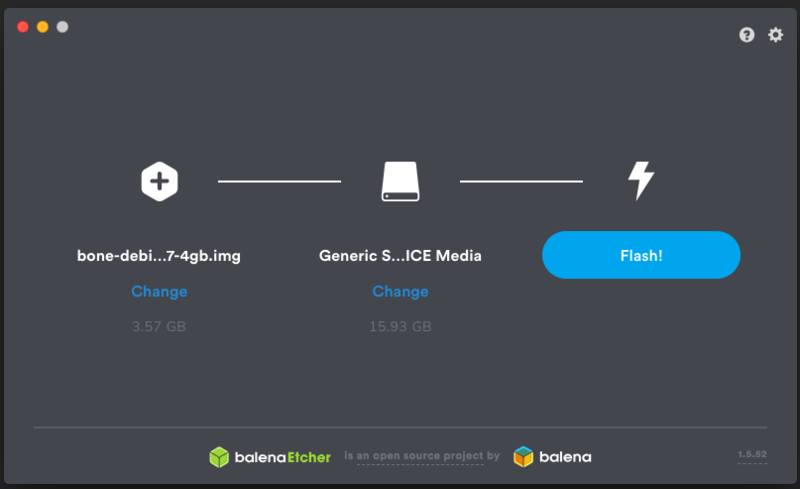 Some general help on programming SD cards can be found on the Ubuntu Image Writer page. Use your computer's SD slot or a USB adapter to connect the SD card to your computer. Use Etcher to write the image to your SD card. 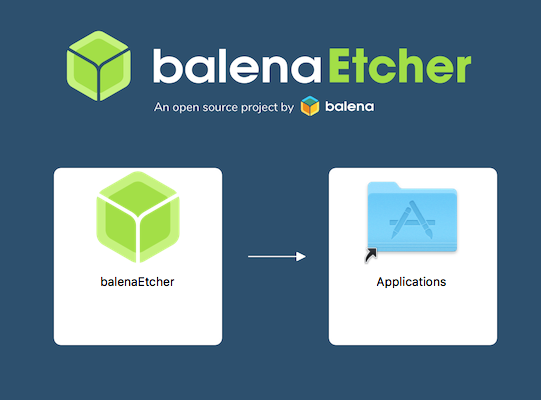 Etcher will transparently decompress the image on-the-fly before writing it to the SD card. Eject the newly programmed SD card. Insert SD card into your (powered-down) board, hold down the USER/BOOT button (if using Black) and apply power, either by the USB cable or 5V adapter. If using an original BeagleBone or PocketBeagle, you are done. If using BeagleBone Black and desire to write the image to your on-board eMMC, you'll need to follow the instructions at http://elinux.org/Beagleboard:BeagleBoneBlack_Debian#Flashing_eMMC. When the flashing is complete, all 4 USRx LEDs will be steady on or off. The latest Debian flasher images automatically power down the board upon completion. This can take up to 45 minutes. Power-down your board, remove the SD card and apply power again to finish. If any step fails, it is recommended to update to the latest software image to use the instructions above. Most Beagles include a USB cable, providing a convenient way to provide both power to your Beagle and connectivity to your computer. If you provide your own, ensure it is of good quality. You'll connect the "type-B" plug of the USB cable to your Beagle and the "type-A" plug to your computer. Note that BeagleBoard-X15 must always be powered instead by a 12V adapter with a barrel jack. Alternatively, for Beagles other than BeagleBoard-X15 and BeagleBone Blue that require 12V, you can utilize a 5V adapter connected to the barrel jack. If your Beagle was provided with an SD (microSD) card, make sure it is inserted ahead of providing power. Most Beagles include programmed on-board flash and therefore do not require an SD card to be inserted. You'll see the power (PWR or ON) LED lit steadily. Within a minute or so, you should see the other LEDs blinking in their default configurations. If connected via USB, a network adapter should show up on your computer. Your Beagle should be running a DHCP server that will provide your computer with an IP address of either 192.168.7.1 or 192.168.6.1, depending on the type of USB network adapter supported by your computer's operating system. Your Beagle will reserve 192.168.7.2 or 192.168.6.2 for itself. If your Beagle includes WiFi, an access point called "BeagleBone-XXXX" where "XXXX" varies between boards. 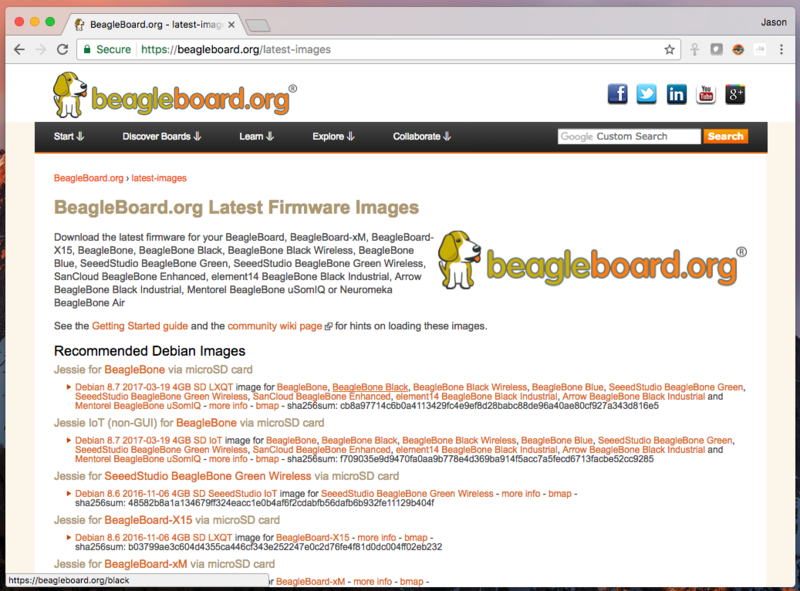 The access point password defaults to "BeagleBone". Your Beagle should be running a DHCP server that will provide your computer with an IP address in the 192.168.8.x range and reserve 192.168.8.1 for itself. If your Beagle is connected to your local area network (LAN) via either Ethernet or WiFi, it will utilize mDNS to broadcast itself to your computer. If your computer supports mDNS, you should see your Beagle as beaglebone.local. Non-BeagleBone boards will utilize alternate names. Multiple BeagleBone boards on the same network will add a suffix such as beaglebone-2.local. The below table summarizes the typical addresses and should dynamically update to indicate an active connection. Note that you must load this page without HTTPS security for the automatic detection to work. With the latest images, it should no longer be necessary to install drivers for your operating system to give you network-over-USB access to your Beagle. In case you are running an older image, an older operating system or need additional drivers for serial access to older boards, links to the old drivers are below. If in doubt, try the 64-bit installer first. Note #1: Windows Driver Certification warning may pop up two or three times. Click "Ignore", "Install" or "Run"
Note #2: To check if you're running 32 or 64-bit Windows see this: support.microsoft.com/kb/827218. Note #3: On systems without the latest service release, you may get an error (0xc000007b). In that case, please install the following and retry: www.microsoft.com/en-us/download/confirmation.aspx?id=13523. Note #4: You may need to reboot Windows. Install both sets of drivers. Note: Additional FTDI USB to serial/JTAG information and drivers are available from www.ftdichip.com/Drivers/VCP.htm. Note: Additional USB to virtual Ethernet information and drivers are available from www.linux-usb.org/gadget/ and joshuawise.com/horndis. Older software images require you to EJECT the BEAGLE_BONE drive to start the network. With the latest software image, that step is no longer required. Virtual machines are not recommended when using the direct USB connection. It is recommended you use only network connections to your board if you are using a virtual machine. When using 'ssh' with the provided image, the username is 'debian' and the password is 'temppwd'. Visit beagleboard.org/support for additional debugging tips. 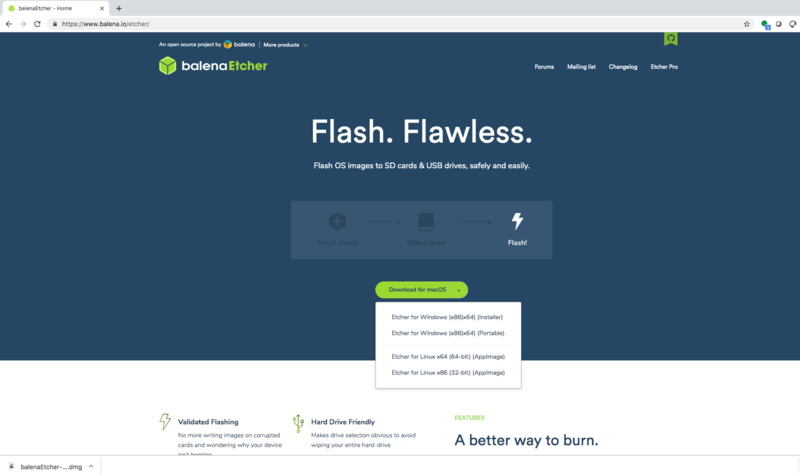 Some of the starting images below involve multiple steps to produce an SD card image or otherwise change some of the steps above, so be sure to read all the instructions on their pages. Choose the starting point you want, download or produce the SD card image and follow the steps above. At the time of release, not all of these distributions support BeagleBone Black, but should soon. Time to read that manual and check out the design materials: BeagleBoard, BeagleBoard-xM, BeagleBoard-X15, BeagleBone, BeagleBone Black, BeagleBone Black Wireless, and BeagleBone Blue. 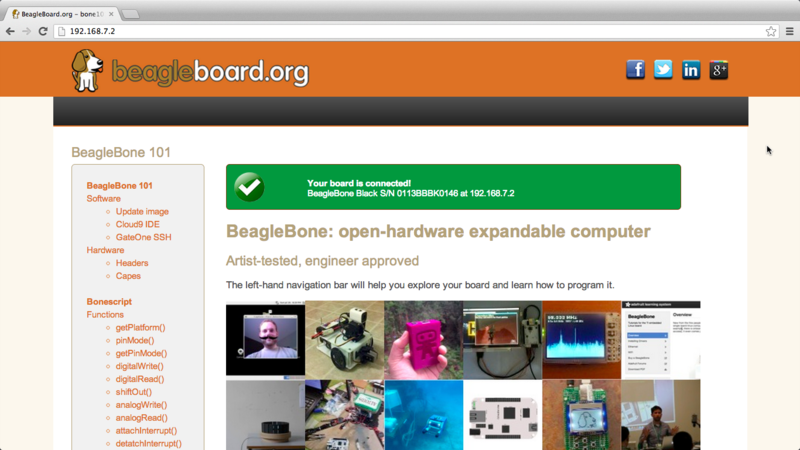 Other links to design materials for various releases can be found at beagleboard.org/hardware/design. 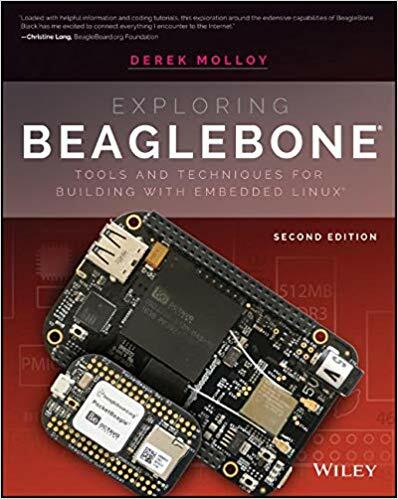 For a complete list of books on BeagleBone, see beagleboard.org/books. Perfect for high-school seniors or freshman univerisity level text, consider using "Bad to the Bone"
A lighter treatment suitable for a bit broader audience without the backgrounders on programming and electronics, consider "BeagleBone Cookbook"
To take things to the next level of detail, consider "Exploring BeagleBone" which can be considered the missing software manual and utilize "Embedded Linux Primer" as a companion textbook to provide a strong base on embedded Linux suitable for working with any hardware that will run Linux. Last updated by default on Wed Oct 10 2018 16:31:11 GMT-0000 (UTC).